Apple and Samsung both saw large increases in smartphone ownership under each brand in the U.S., according to a new report published by The NPD Group. Over the last year, between the fourth quarter of 2012 and the fourth quarter of 2013, ownership of iPhones in the U.S. increased from 35 percent to 42 percent, once again securing Apple’s clear lead over Samsung in the United States. Ownership of Samsung devices, which includes all Samsung smartphones, increased from 22 percent in Q4 2012 to 26 percent in the fourth quarter of 2013, The NPD Group said. 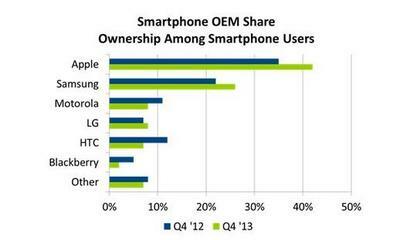 Meanwhile, U.S. smartphone ownership of devices made by Motorola, HTC and BlackBerry all dropped off. In other words, fewer people owned those devices in Q4 2013 than during Q4 2012. LG saw slight gains, however, beating out HTC. The NPD Group also found that U.S. smartphone users are consuming more data than ever, which isn’t particularly surprising given the new reliance on cloud storage and cloud-based music and video services. While most carriers usually suggest the average consumer uses about 2GB of data per month, The NPD Group said the figure was 6.6GB per month as of the fourth quarter of 2013, up from 5.5GB during the same period a year-ago. That’s a huge amount of data, and The NPD Group attributes it to “the adoption of streaming music services such as Pandora and iHeart Radio,” the two most popular smartphone music apps. Spotify came in as the third most popular music app, followed by TuneIn Radio and Slacker Radio. The report makes one thing clear, at least in terms of smartphone usage in the U.S. – that Samsung and Apple continue to be dominant players, and continue to eat away at market share from other market participants. 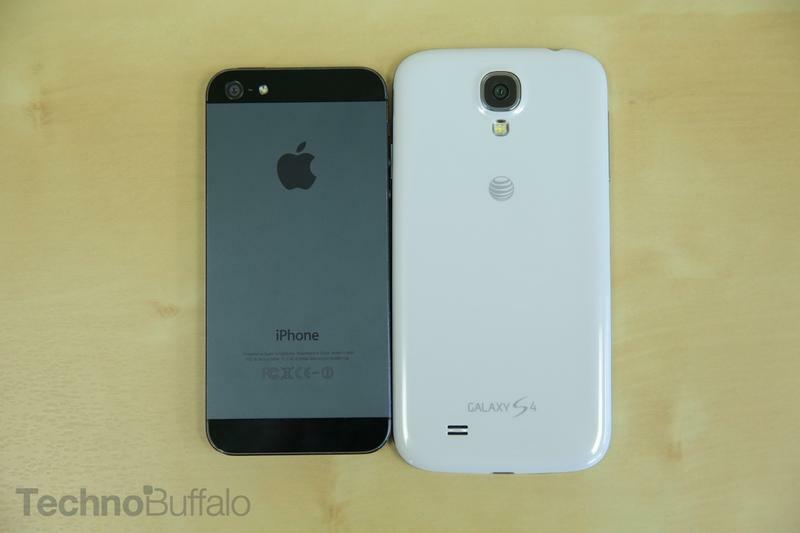 Motorola, HTC and BlackBerry certainly have their work cut out in 2014.